Taro (Talas/ Bentul) or Colocasia Esculenta in Latin, is widely tropical plant in Southeast Asian, East Asian, African and Mediterranean Basin. 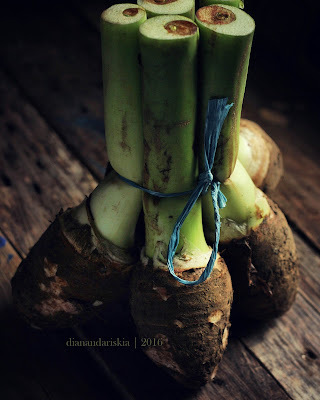 The root vegetable is grown for its edible starchy corm (and some as a leaf vegetables). The corms have a light purple color due to phenolic pigments. Contains of natural sugars, talas has a sweet nutty flavor and smooth texture when it’s cooked. 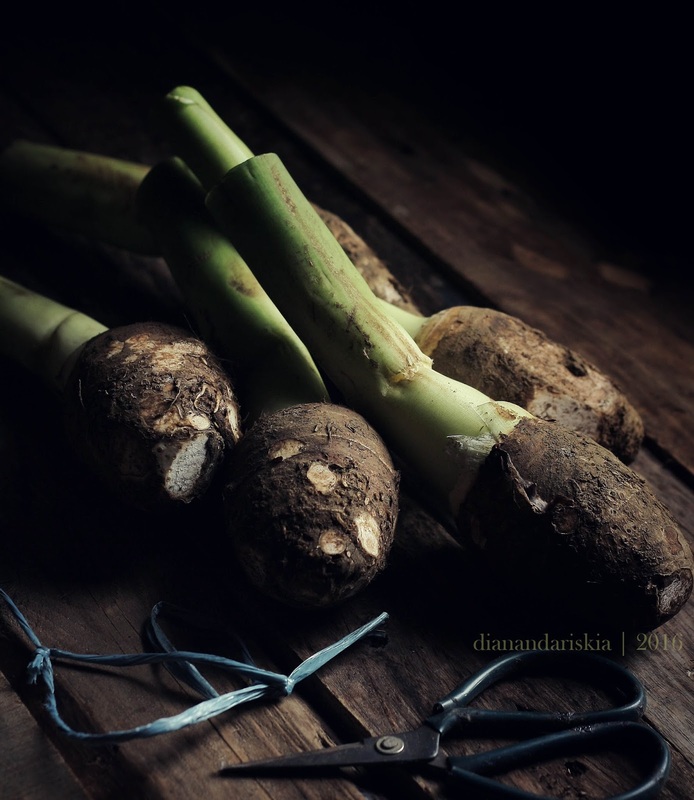 In Indonesia, Talas is usually steamed and simply served with salt or shredded young coconut. But it’s also common to find fried talas in traditional street vendor. Or most of times, steamed cubed talas is used as Ambonese sago porridge mixture, just like what my mother used to make. The slightly sweet soft talas is a real soul mate to jelly like texture of Ambonese sago porridge and thick coconut sauce. I promise I will make old fashioned sago porridge on my next post! In the last following years, Lapis Talas Bogor (Bogor Layered Taro Cake) is booming and i just can't wait to make it. 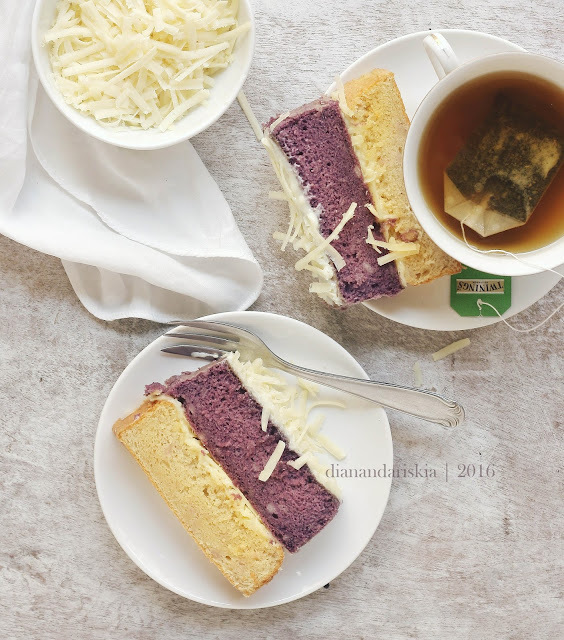 I don’t exactly know the original taste, since I never try them (and waiting Bogor people aka Henny Marlina to send me the popular cake is like waiting a miracle). 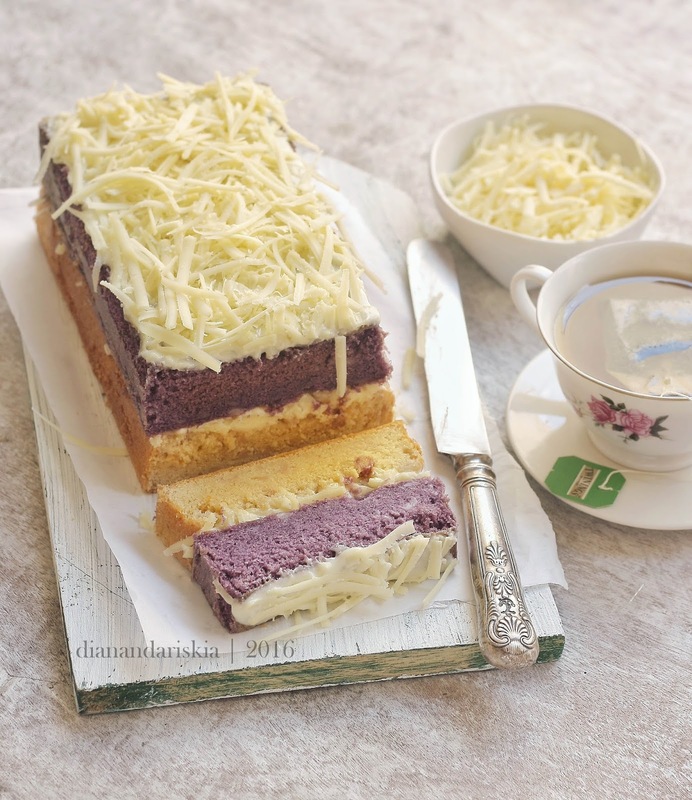 So this recipe isn't authentic or resembles the famous Lapis Talas Bogor. But one thing for sure, this cake is really great! The texture is moist with a decent taro taste blended perfectly with cream cheese frosting and shredded cheddar. 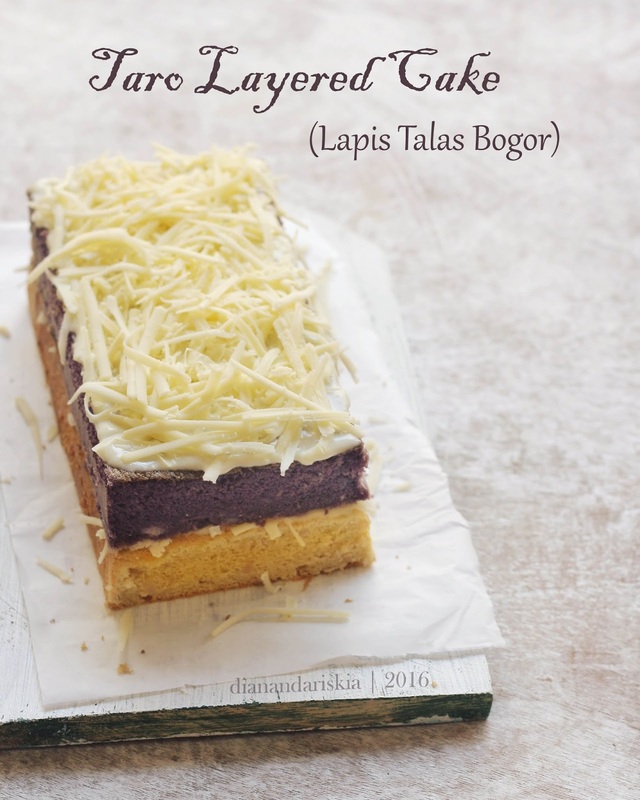 Just be sure to add Talas Flavor (perisa talas) or Taro powder to enhance the talas flavor and give a sweet purple color. Pre heat oven to 170 C. Sift flour and baking powder set aside. Using blender, mix steamed talas and fresh milk, set aside. Grease 2 22x10 cm pan, line base with baking paper. Beat sugar and eggs until thick and pale, carefully add flour mixture and process until just combined. Add talas mixture, mix until combined. Lastly, pour melted butter into the batter then mix. Divide the batter into two bowls, add Taro flavor and mix in the first bowl while yellow color to the second bowl. Spoon onto 2 prepared pan and bake for 30-35 minutes or until firm to touch. Set aside to cool slightly before turning out onto a wire rack to cool completely. 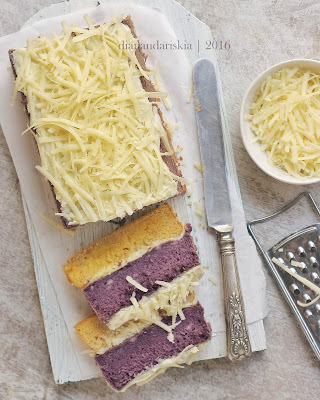 Take the yellow cake and spread it with cream cheese frosting then shredded cheddar. Sandwich together with the purple layer, spread with cream cheese frosting and top with shredded cheddar. Slice the cake, enjoy with your beloved.